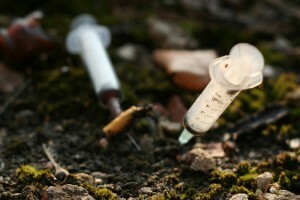 Finding needles in community areas such as parks is a health and safety concern for everyone. Used syringes should be disposed of properly in order to protect others from injury and infections like Hepatitis C and HIV. 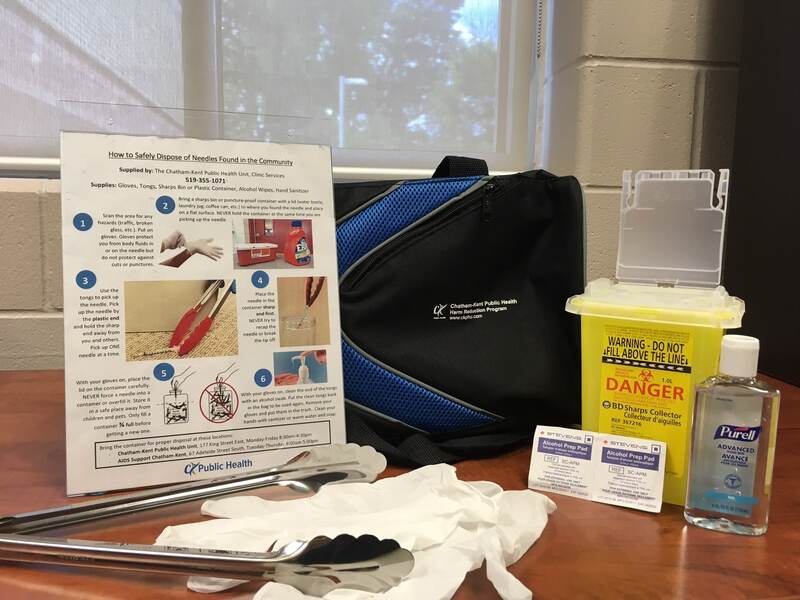 It’s important to remember that the risk of becoming infected with one of these infections through a needle-stick injury is very low. Prevention is the best way to stay safe. Step 1: Scan the area for any possible dangers (traffic, tripping hazards). Step 2: Put on gloves. Gloves protect you from any body fluids in or on the needle, but do not protect against cuts or puncture injuries. Step 3: Bring a puncture-proof container with a lid to where you found the needle. Sharps containers work best but you can also use a water bottle, pop bottle, coffee can, laundry jug, etc. Step 4: Put the container on flat ground beside the needle. Never hold the container while picking up the needle at the same time. Step 5: Use the tongs to pick up the needle. Pick up the needle by the plastic end with the sharp end facing down. Hold it away from your body and others. If there are multiple needles pick them up one at a time. Step 6: Place the needle in the container sharp end first. Never try to put the cap back on the needle or break the tip off. Step 7: With your gloves still on, place the lid on the container. Be sure the container is not too full and nothing is coming out of the opening. Only fill the container ¾ full before getting a new one. Wipe the end of the tongs with an alcohol swab to be used again. Step 8: Remove gloves and wash your hands with hand sanitizer or warm water and soap. For more information please contact the Chatham-Public Health Unit at 519.355.1071 ext. 5901 or visit us at http://www.chatham-kent.ca.